The State University of New York at Fredonia has had a long and rich history of academic excellence, dating back to 1826. 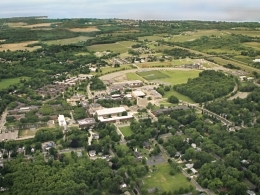 Originally one of New York State’s teacher training colleges traditionally specializing in music education, Fredonia became a vital part of the new State University of New York system in 1948. Today it offers over 100 degree programs in the liberal arts, natural and social sciences, education, mathematics and business. It also features cutting edge programs in the emerging fields of technology, service and communication. Early Decision applicants must complete their application by November 1st. SUNY Alfred offers a variety of on-campus types based off your lifestyle and choice. There are also a number of affordable apartment options directly next to campus. Fully accredited by the Board of Regents of the State University of New York and by the Commission on Higher Education of the Middle States Association of Colleges and Schools. Named a College of Distinction in 2014, achieving national recognition for quality teaching, vibrant community and innovative learning experiences. As a member of the SUNY system, credits from SUNY Alfred will transfer to any college or university within the 64-member system.